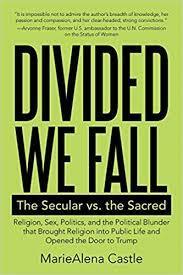 Divided We Fall: The Secular vs. the Sacred, by Marie Alena Castle (Bloomington: Archway Publishing, 2018, ISBN 978-1-4808-6132-9). 244 pp. Softcover, $17.99. Marie Alena Castle, for decades a tough-as-nails activist in Minnesota for abortion rights and church-state separation, died on May 25, 2018—the very same day, coincidentally, that voters in Ireland approved an abortion-rights referendum by two to one. Castle was ninety-one and had recently completed writing this book. Castle covers a wide range of church-state issues: abortion rights, overpopulation, sectarian influence on hospitals and health insurance, “faith healing” threats to children, the campaigns to divert public funds to church-run private schools, the controversies over creationism versus evolution and sexuality education in our public schools, sectarian influence in public schools, and such issues as tax benefits for religious and other organizations (secular organizations such as Planned Parenthood, the Red Cross, etc.). The last item is so extremely complicated and settled (sort of) by the Supreme Court’s 1970 Walz v. Tax Commission ruling that it must wait for another time.